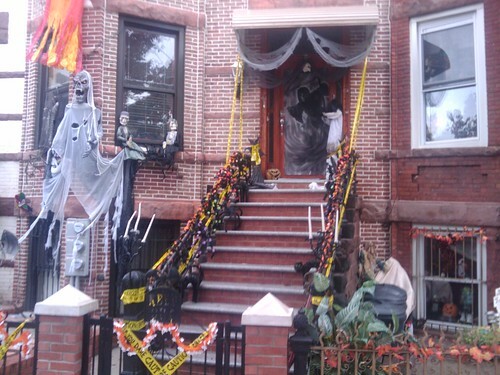 I realize that some people might object to Halloween decorations being regarded as a home renovation topic. But it’s not your parents’ Halloween anymore where you carve a pumpkin, hang a cardboard skeleton on the front door and wait for the candy grovelers to show up. 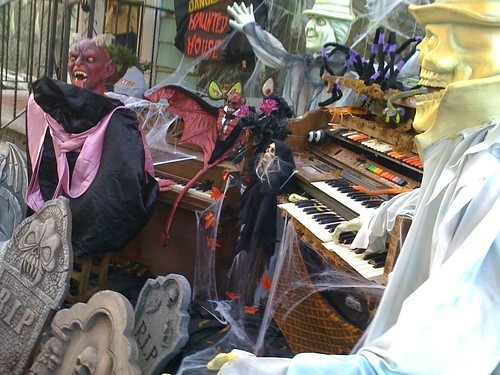 Technology, marketing and plain ol’ show biz have made Halloween a neighborhood DIY competition worthy of at least a little notice from the home reno media. Here’s my neighbor, Tony, setting up his display with his grandson, Joseph. This one has haunted sound effects triggered by a proximity sensor, as I discovered at 4am this morning when a newspaper delivery boy or stray cat set them off. Which in turn set off my dogs. Tony’s display changes every year as he finds new items at Home Depot and Costco. I saw some of these displays at Christmas Tree Shop and they’re not cheap. Twenty bucks here, thirty bucks there… it quickly adds up to real money! 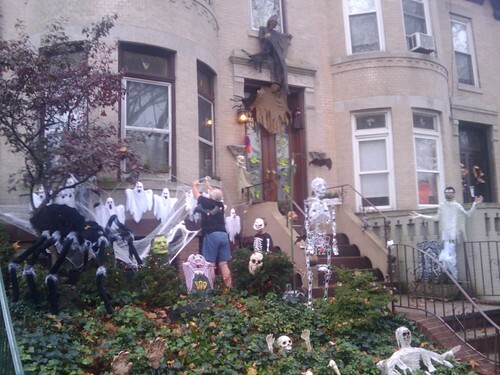 He probably has enough invested in Halloween decorations to pay for new landscaping for the front of his house. On a neighboring street, the owner went more the DIY route with his decorations. This was a work in progress that he started on in early October. It extends vertically to the roof line, incorporating a psychotic clown hanging from the cornice. Note to self: I have to ask the owner where he got the mask because it looks like it’s from my favorite B movie of all time, Killer Klowns From Outer Space. The Halloween displays get crazier and more elaborate as you head east towards 13th Avenue, where they also put on some of the best Christmas light shows in the country. You can see a preview of Dyker Heights Extreme Christmas here.